Have a blast playing pong in our out of the water! It floats level and fits standard 16oz cups. A fun activity for pool parties, backyard barbecues, and tailgating. Made of sturdy thick buoyant foam for added stability in the water. Great for securing cups on tabletops too. Use as a floating drink holder when not playing the game. Measures 15.4 in x 2.84 in x 14.6 in. Each Kelsyus Floating Pong sold separately. You supply the plastic cups and ping pong ball. 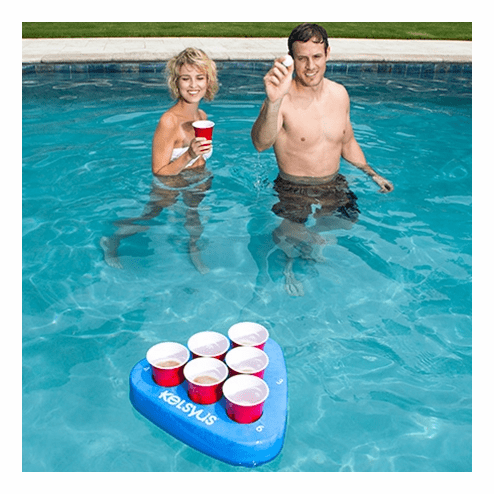 SAVE BIG by adding a second Floating Pong!